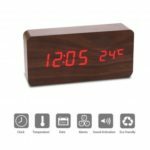 This Multifunctional Wooden LED Digital Alarm Clock is exquisite and fashionable, and the wood shape and texture will bring the breath of nature into your room. 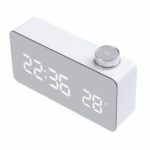 It Displays time, date and temperature, Alarm function with soft and gentle light that you can clearly see the time even at night. 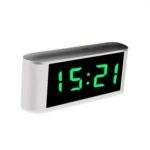 Can be set to power saving mode, enabling any touch to the clock or make a sounds to wake up the display for 15 seconds. Displays time, date and temperature, Alarm function, 3 alarms that is perfect for people that need to wake up early. Wood shape and texture bring the breath of nature into your room. The perfect fusion of a simple alarm clock, practical and elegant appearance. Display in the smooth wood surface, you can clearly see the time even at night. Can be powered by 3 x AAA dry batteries (not included) or DC 5V/500mA.